Perth Old Furniture Removal & Recycling | 1-800-GOT-JUNK? When the junk starts to pile up around your home or office, you just want it gone. If only removing rubbish was that easy! The local rubbish hauling companies are picky about what they accept and don't, and even if they'll haul it away you still have to drag it out to the curb or haul it up from basement storage. 1-800-GOT-JUNK? is in your neighborhood and happy to help you remove old furniture! 1-800-GOT-JUNK? is a Perth old furniture removal and recycling service that prides itself on taking an environmentally responsible approach to the business of hauling away the clutter in your home or business. We've provided our trusted junk removal since 1989, and today we're the world's largest junk removal service. If you don't own a vehicle large enough to haul away junk and rubbish like old furniture, you're going to find it difficult to get rid of these large, bulky items. Not only are junk items like unused furniture going to require a large vehicle to remove, it is going to require the assistance of a few people to help lift and move those items. With 1-800-GOT-JUNK?, you won't have to worry about any of those factors. If you have old furniture taking up space in your Perth home, 1-800-GOT-JUNK? can help you say goodbye junk, hello relief! We'll send our truck and crew out to your home or office to offer you a no-obligation, onsite estimate for your junk removal. We even offer same-day service and provide you with a two-hour window to expect our truck during. Our friendly, uniformed Perth furniture removal and recycling team will call you within 15-30 minutes of their arrival so you're ready when we get there. Once we arrive, just point and junk disappears. We'll let you know which items we can haul and how much it is going to cost. 1-800-GOT-JUNK? uses volume pricing. Rather than making you pay certain amounts for specific items and hitting you with fees and fuel surcharges, we provide a fair and transparent quote. 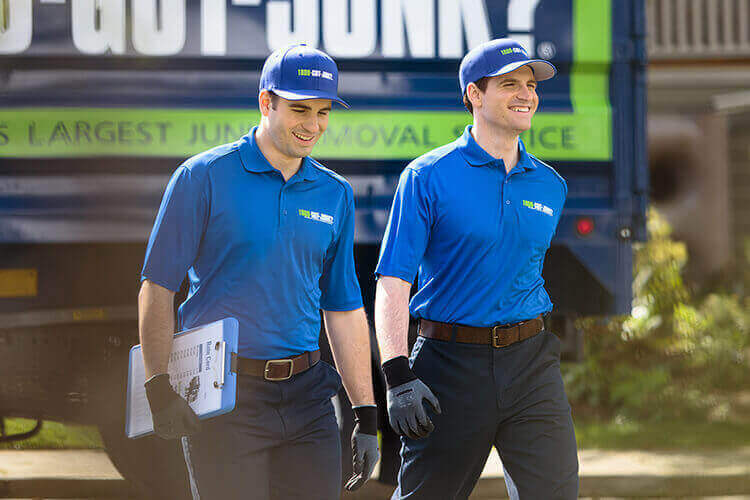 If you'd like to point and see junk disappear, 1-800-GOT-JUNK? can help! Give us a call today or go online to schedule your free estimate now!